Having difficulties looking for high pressure ball valves? We can help you because we have all sizes. Our range of hydraulic ball valves has a working pressure of up to 700 Bar and varies with the sizes. These ball valves are usually made from steel and stainless steel materials. The common connection for high pressure ball valves are threaded type or compression type. Size Range: 1/8" to 2 1/2"
High pressure ball valves are flow valves that used to control, restrict or shut off liquids and gases in the system line. It is a quarter-turn valve which uses a floating ball to control the flow. The flow will go through when the hollow ball is in line with it and close when pivoted the handle by 90˚ rotation. ​High pressure ball valves are commonly used in construction and agricultural, fire protection, marine & offshore, oil & gas, and process industry. Due to its difficulty to clean, they are not recommended for the purpose of food and beverages, and pharmaceutical. The available material for high pressure ball valve is Steel (112A/212A/192A) and Stainless Steel (442A). For more information about material details, please refer to the MHA Catalogue. It is important to know the type of applications, and working temperature to determine the material for ball valves parts such as ball seat, and seal for stem and adaptor. For Steel material, the temperature range are from -20˚C to 100˚C. For Stainless Steel material, the temperature range are from -30˚C to 100˚C. 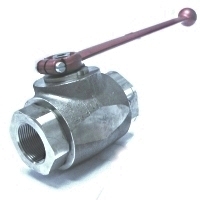 The available sizes for high pressure ball valves are ranged from 1/8" to 2 1/2". There are two different types of ball valve body design. 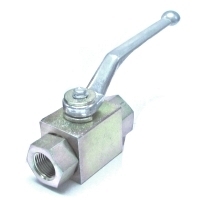 For sizes ranged from 1/8" to 1 1/2", the ball valves are design in BKH type (square body). While for sizes ranged from 1 1/4" to 2 1/2", the ball valves are design in MKHP type (round or hexagon body). Reduced bore type ball valves are also available for certain sizes. For BKH type, the maximum working pressure range is from 315 Bars to 500 Bars, depending on the ball valve sizes. For MKHP type, the maximum working pressure is 420 Bars. The common available connection for high pressure ball valve is NPT (National Pipe Thread) and BSPP (British Standard Pipe Parallel). For NPT thread, it is according to ANSI B1.20.1 while for BSPP thread, it is according to DIN ISO 228. There are other connection types that are available upon request which is Compression type (DIN 2353/ISO 8434-1), SAE J514 female thread, ISO 7/1 Rc female thread, and ISO 8434-3 ORFS male thread. ​For more information regarding ball valves, please refer to ​en.wikipedia.org/wiki/Ball_valve.